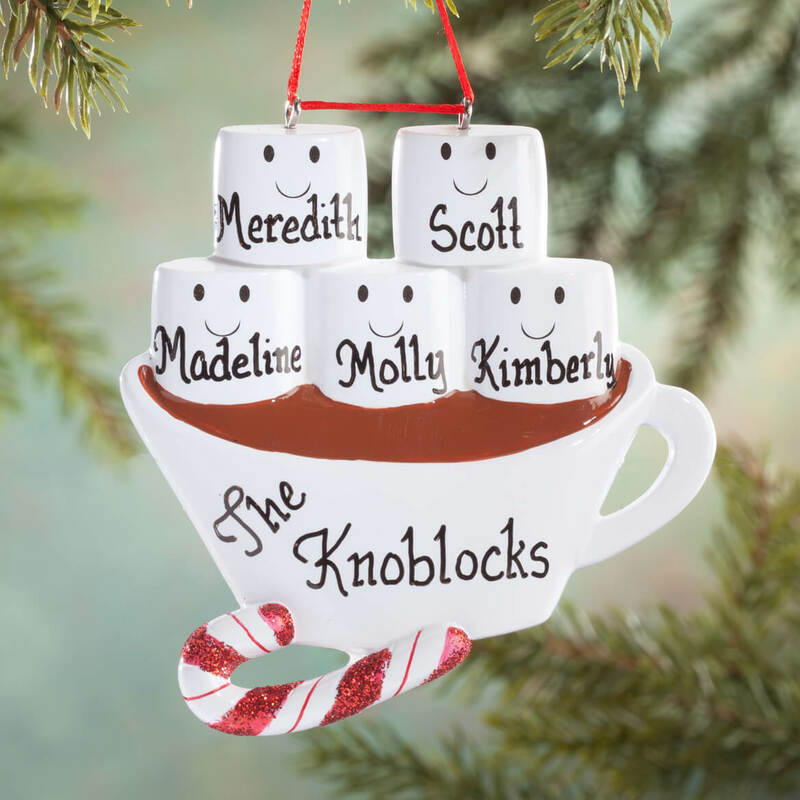 Ordering this ornament and having it personalized and sent to dear friends in a different state without me seeing the finished product worried me. I didn't don't need to be. Order was perfect names all spelled right and it arrived in time for Christmas. They loved it. Thank you! My wife chose this. A new ornament each year to put on the tree, plus the addition of our grand-daughter to be added to the family ornaments. My great granddaughters love hot chocolate. It's cute and different from any others she has. I purchased this for my nephew & his family & they loved it. Personalized gifts are always a hit & this one was especially cute. Put a smile on everyone's face. Tradition of buying an ornament for a big family! Makes a good family Christmas memento. For my son and his family. I love the marshmallows in the cup of hot chocolate. I like it also because I think it is unusual and fitting for the season. Thank you Miles Kimball I always enjoy your ornaments and have ordered from you for several years. 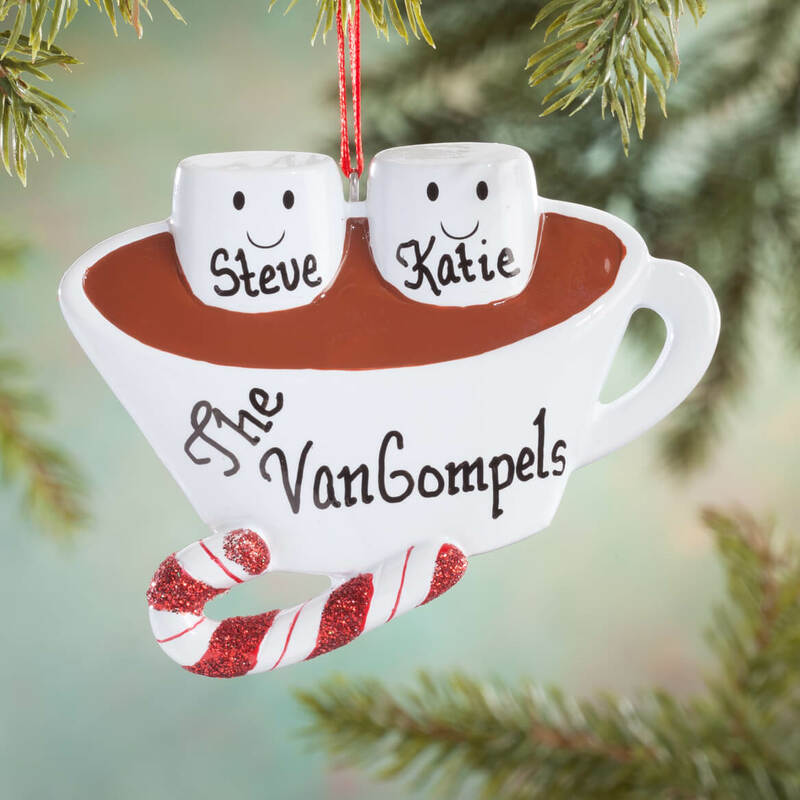 Order personalized family ornaments each year for children. Always good quality and designs are great. This is for an office Christmas tree representing our dept. I chose it because it depicts a group of people that does not include "parents". This ornament was cute and different from others. I think it is cute and thought the couples I chose it for would like it also. I actually liked the Reindeer 360620 better, however, in the final check...the names that I filled in on the descriptions did not match the visual that came up and I was hesitant to take a chance...so the cocoa cup was a second choice. Very cute though. Someone should check the functionality regarding the other ornament I mentioned above. It is difficult to find a family of two for a single parent and one child. This was the most reasonable price for this same product everywhere I checked. It’s so cute. Buy ornaments every year from here, think I’ve got most of them! Need new choices. The chocolate is chocolate colored. Not red like some other ornaments. 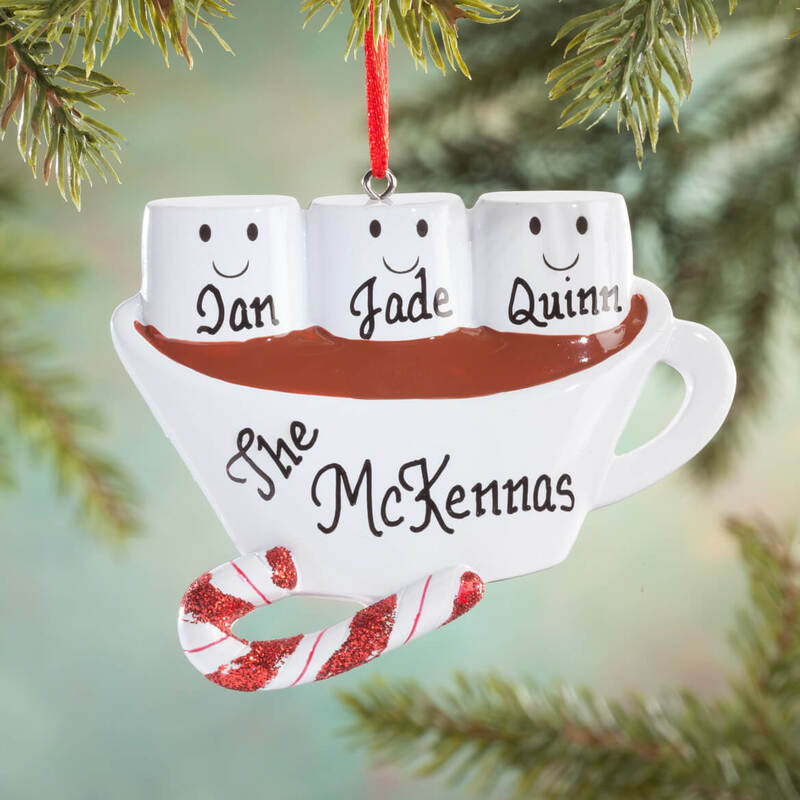 The ornament seemed appropriate for the family because of the hot chocolate theme. 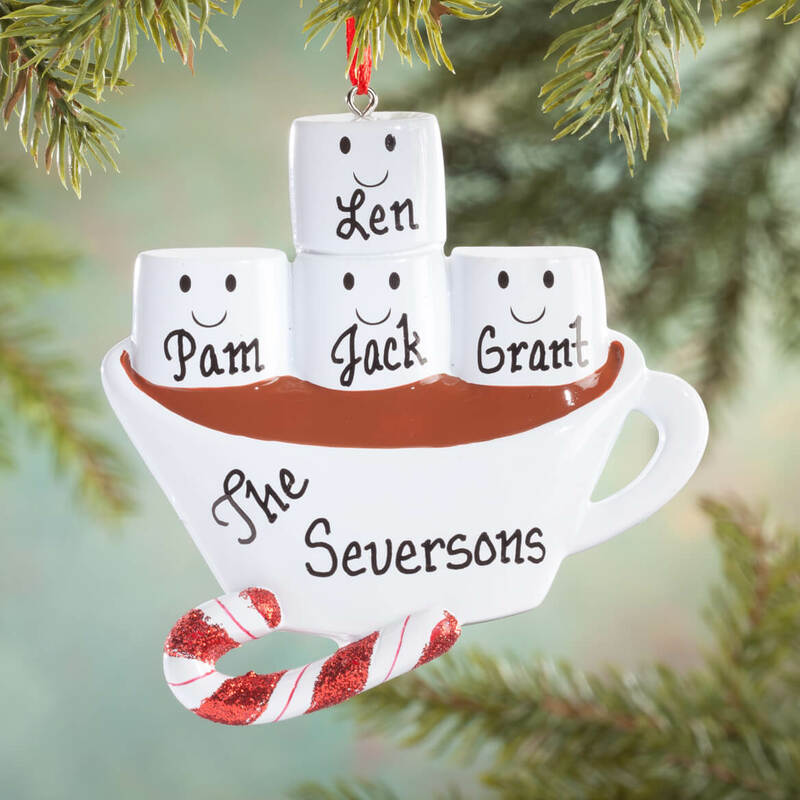 I chose this ornament because I could add their pets names on it. I have not seen this particular ornament in kiosks with ornament sales. I just wish it had a place for the year. 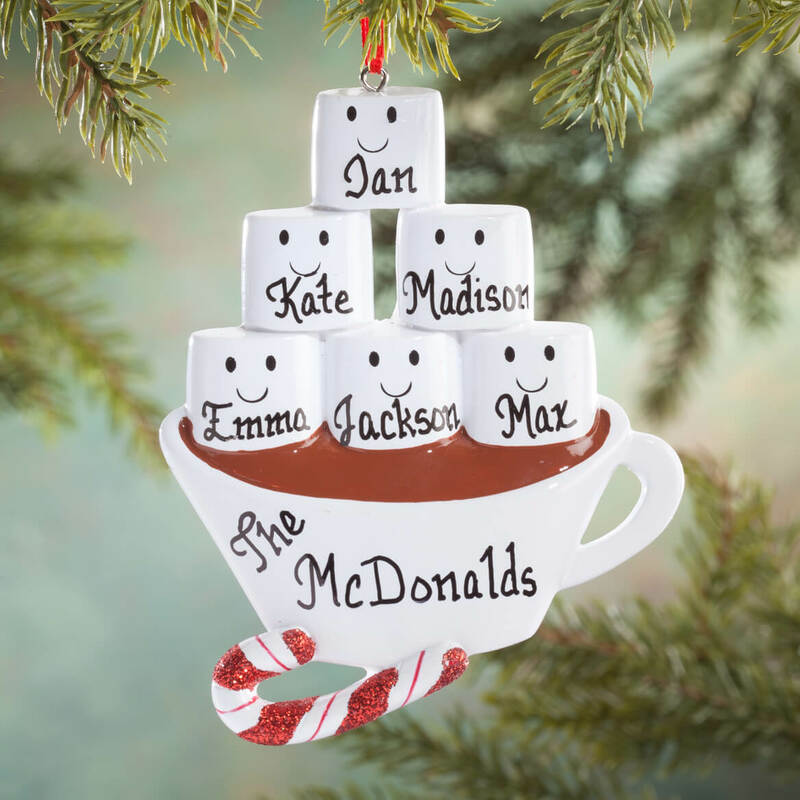 Personalize the hot chocolate ornament? How do I do that? Hi, I was wondering if the year could also be put on this ornament? I will order one if it can be. Thank you. BEST ANSWER: Thank you for your question. We can not put the year on it unless it can fit on the same line as the other personalization. We hope this information will be of help to you. 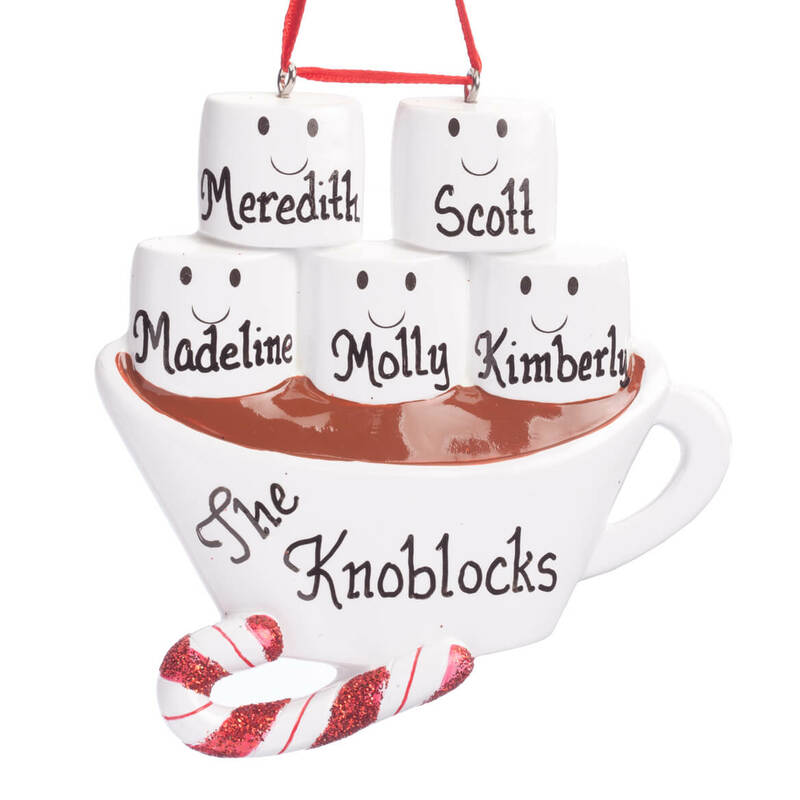 Where do we personalize the ornament? I can't find a spot to Write out the names. What order are the names written on the marshmallows? BEST ANSWER: Thank you for your question. They print left to right. We hope this information will be of help to you. Is this 3 d or flat? Do you have one that has a place for 8 people( names )? BEST ANSWER: Thank you for your question. Unfortunately this only goes to a family of 6. We hope this information will be of help to you. BEST ANSWER: Thank you for your question. The ornament measures 4.75" x 3.63". We hope this information will be of help to you.